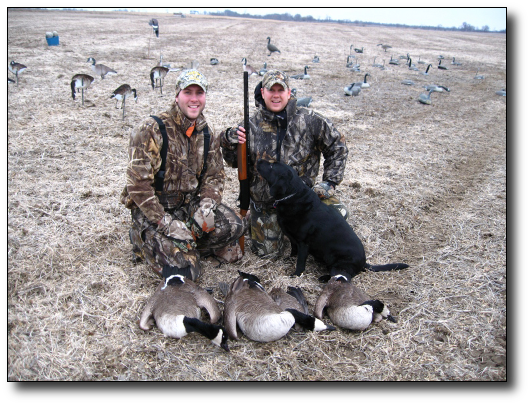 HSP members Kit, Brandon and Dave Young teamed up for a late season goose hunt at the "pits." "We had our chances for limiting out, "Dave noted." 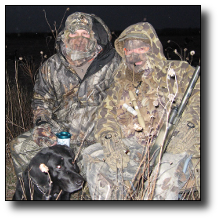 "Trying to stay concealed while calling the geese kept me at a disadvantage." "I was supposed to call the shots. But several geese, while clearly in range, escaped before I hollered "TAKE 'EM." It was a cold blustery day, but that is what was needed to force the geese into the air. Numerous flocks worked us but failed to come within range. Still, it was quite a sight and when those big Canada Geese set their wings and started heading into the decoys, we didn't notice the cold temperature or the wind! My lab "Fay" was not to be denied. She begged to go along and I relented. My concern was the thickness of the ice on our pit. Dogs could easily break through the ice once they venture out several yards. Getting them out could be a real danger. However, to my surprise, our pit was all open water.